While waiting for your Engine C1 to arrive, please go to origo.io and register an account. You will need this account if you wish to manage your Engine from origo.io and install apps from the app store. In order to register you will need a PayPal account. If you do not have one, please create one first at paypal.com. After receiving your Engine C1, you should of course get it installed in your server room or co-location facility, or any place with good ventilation and a decent network connection. Be warned, it is heavy, do not lift one on your own, always be at least two persons when moving one around. You will need 1 Ethernet cable with network connectivity and DHCP service. It should at least have outbound access to the Internet. For management via origo.io, it should also at least have inbound connectivity on port 443 (https). For running VM’s which make services available through the Internet, you should also have at least one contigous range of IP addresses which can be assigned to these VM’s. The external IP addresses will be mapped to internal IP addresses which the VM’s have access to. These mappings are (unsurprisingly) called “IP mappings”. If you have two contigous ranges, you can use the second range for IP addresses, which are directly assigned to the VM’s. These are called “external IPs”. You will also need 2 power cables which should be able to supply up to 1.000 Watts each, one monitor with a VGA cable and one USB keyboard. Plug network, VGA, keyboard and power in, make sure the two power supplies are in the “on” position, and then turn on the Engine by pressing the power button on the back. It should light up blue. After about 30 seconds you should be greeted by a login prompt. At this point the Engine is not open for SSH or web log in over the network, but you may still log in from the console. Log in using “origo” as both user name and password. At the prompt please type “passwd” and then type in any reasonably secure password of your choosing. At this point your Engine has it’s IP address assigned by DHCP. If you have a fixed IP address you wish to assign to your Engine, now is the time. If you are a seasoned Ubuntu administrator, just do your thing, and assign the IP address to eth0. If not, take a look at the man-page for “/etc/network/interfaces” (type “man interfaces”). Now please type “dpkg reconfigure steamengine”. You will be asked to enter the domain name you wish to use for your Engine, and a user name and password for the admin user. If you do not have a domain name registered for your Engine, you can leave this empty for now. Your Engine will then use it’s IP address in URL’s. You can repeat this step, if you register a domain name later. As user name please use the user name you registered with at origo.io. This is important, since it will allow you to link your engine with origo.io. For password use any reasonably secure password of your own choosing. 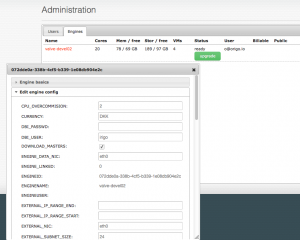 After completing this, you can log in to your Engine over the network using SSH. SSH access is only enabled from your local subnet. If you wish to have access from other networks, please add these manually to “/etc/hosts.allow”. Back at your desk, fire up a web browser, and point it at “http://domain.name.of.your.engine/steamengine/” and log in with the user name and password you chose for your admin user in step 3. On the “info” tab of the “Dashboard”, you will see the text: “This engine is not linked to origo.io. Link”. Please click “Link” to bring up the dialog shown on the right. You can now link your engine with origo.io, using the password you registered with on origo.io. After linking your engine, it should automatically begin downloading master images used by the various apps in the App Store. You can check this process by going to the “Images” tab and selecting “shared master images” from the drop-down. Depending on your network connection this can take a few minutes or several hours. While your engine is downloading master images, you can log in at origo.io, and select “administration” from the drop-down in the top right corner. Now take a look at your engine’s configuration on origo.io. If you want to change network ranges, the name of your engine, the storage attached, etc. this is where you should do it. Most of this information will end up in “/etc/steamengine/config.cfg”. You can edit this file manually too, and click “update” on “info” tab of the “Dashboard” to send your updates to origo.io. Once master images have finished downloading, you can begin installing the apps that use them. Click “New…” in the upper left corner of the “Dashboard”, select the app you would like to try. Maybe your company needs a new website – try out the WordPress app. Or maybe you are looking for a new file server with sync – give the File Server app a try. After clicing “Install”, sit back and wait. After 20 seconds to a few minutes depending on the app, you should be presented with a nice UI to help you get started with the app.